To Cite: Eidi S, Kamali S A, Hajari Z, Fata A, Farid Hosseini R, et al. Nasal and Indoors Fungal Contamination in Healthy Subjects, Health Scope. 2016 ; 5(1):e30033. doi: 10.17795/jhealthscope-30033. Background: Fungi are regarded as one of causal factors of respiratory allergies and are a serious threat to public health in indoor environments. Before conclusively identifying fungi as the major causative agent of all or some types of rhinitis, we should have a good knowledge of the fungal flora of the nasal cavity and indoor building environments of healthy subjects. Objectives: The aim of this study was to determine the presence and relative abundance of fungal flora in the nasal cavity and bedroom of healthy subjects in Mashhad city, north east of Iran. Patients and Methods: A group of fifty healthy volunteers without a history of respiratory system diseases were selected. Samples from the nasal cavity and different parts of the bedroom including indoor air, pillow, mattress, blanket, dust of the bed, dust of the shelf and dust of the air duct were collected and cultured. The fungi were identified by standard mycological techniques. Results: The most common fungi isolated from all samples were Aspergillus, Penicillium, Yeast, Alternaria and Cladosporium. Stemphylium, Ulocladium, Stachybotrys, Basidiobolus and Exophiala showed the least frequencies among the isolated fungi. Conclusions: The presence of fungi in the nasal cavity and indoors of healthy subjects in this study suggests that fungi should be considered as health hazards. Furthermore, it is important and seems necessary to monitor indoor air quality and raise awareness of existing threats due to microorganisms, including fungi. The problems associated with indoor air quality has in the recent years attracted more concern than several decades ago, in part because it is now clear that most people spend a majority of their time indoors and that the levels of some air pollutants are higher indoors than outdoors (1). Up to 10% of the general population is skin test positive to fungal extracts and among patients with respiratory allergies, 2% to 80% have been reported to be sensitized to fungi (2). More than 80 genera of fungi have been associated with symptoms of respiratory tract allergies (3). Over 225 species of fungi have been observed in indoor building environments, which represent a few of the estimated 1.5 million species of fungi believed to exist (4). Moulds readily enter indoor environments by circulating through doorways, windows, ventilation systems and air conditioning systems. Their spores, through the inhaled air or contaminated water and food, make their way into the human body, particularly via oral and nasal cavities. Were it not for the immune system in the mucosal secretions and the blood-rich mucus of the nasal cavity, the warm and damp cavity would have provided an ideal medium for the growth and reproduction of fungi. However, before conclusively identifying fungi as the major causative agent of all or some (for instance allergic) types of rhinitis, we should have good knowledge of the fungal flora of the nasal cavity and indoor building environments of healthy individuals. No doubt, to diagnose any pathologic condition, we should first know and define the “normal” state as the first step. The aim of this study was to determine the presence and relative abundance of fungal flora in the nasal cavity and bedroom of healthy subjects residing in Mashhad city, the second most populated city of Iran and the capital of Razavi Khorasan province, located in north east of Iran. A group of fifty healthy volunteers without a history of respiratory system diseases were selected. An informed consent form for participation in the research was obtained from all subjects and the study was approved by the Ethics Committee of Mashhad University of Medical Sciences. The selected subjects ranged in age between 15 and 67 years old, and had been residing in the sampled houses for at least one year before the study. The survey was conducted during April to August 2012. The sampling sites for the sleep environment included indoor air, pillow, mattress, blanket, dust of the bed, dust of the shelf and dust in the air duct. Sampling from dust samples was done when the bedroom had not been cleaned for at least 48 hours. The airborne fungal spores were collected by the sedimentation method. This method is commonly employed by various investigators (5, 6). Opened plates containing Sabouraud dextrose agar with Chloramphenicol (SC) were exposed to each bedroom for 15 minutes. To minimize indoor contamination by outdoor molds, we collected samples while windows were closed. Nasal cavity and dust samples were collected using sterile cotton swabs moistened with sterile saline solution (0.9% NaCl). Although it was not possible to demarcate the exact area of the dust samples, they were taken from an area of approximately 4 cm2, in an attempt to standardize the procedure. The swabs were then seeded onto the surface of SC. All plates were incubated at 25 - 27°C for 7 - 14 days. The fungi were identified by standard mycological techniques based upon gross cultural and microscopic morphology. Fisher’s exact and Chi-square tests were used to compare the frequency of fungi in all samples taken from healthy volunteers. All calculations were performed using the SPSS software version 16 and P values of less than 0.05 were considered statistically significant. Out of all healthy enrolled volunteers, 15 (30%) were females and 35 (70%) males. The age range was between 15 and 67 years (median 30). Overall, 400 plates were collected from the nasal cavity and bedroom of 50 healthy subjects, of which 50 were nasal cavity samples and 350 were bedroom samples. 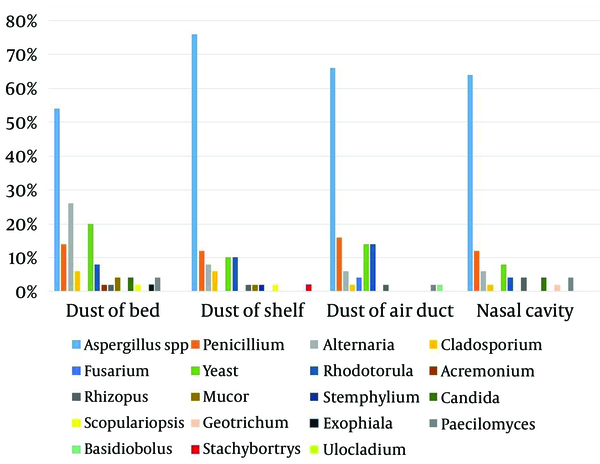 Table 1, Figure 1 and 2 show the frequency of different fungal genera isolated from the nasal cavity and bedroom of 50 healthy volunteers. The most common isolated fungi were Aspergillus, Penicillium, Yeast, Alternaria and Cladosporium. 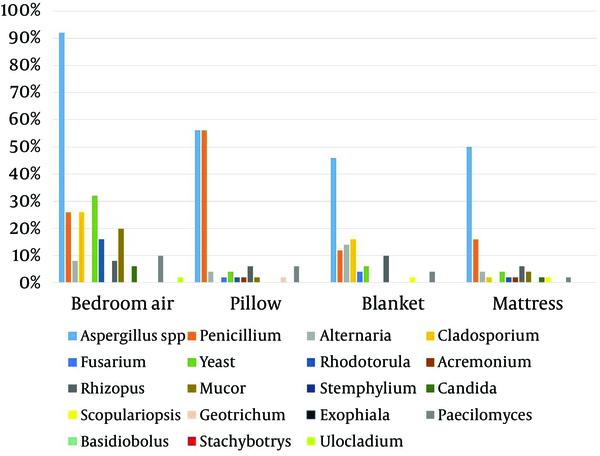 Aspergillus, Yeast and Cladosporium were the most abundant genera in bedroom air samples (92%, 32% and 26%, respectively). Stemphylium, Ulocladium, Stachybotrys, Basidiobolus and Exophiala had the least frequencies among the isolated fungi (2% each). Aspergillus, Penicillium, Yeast, Alternaria and Rhizopus were isolated from all parts of sleep environments and nasal cavity of healthy volunteers. Regarding pillow samples, the frequency of Aspergillus isolates was significantly higher than the other identified fungal genera (P < 0.001), expect for penicillium. The frequency of isolation of Aspergillus spp. from other samples of healthy volunteers was significantly higher than the other isolated fungi (P < 0.002). Airborne allergens play an important role in respiratory allergic diseases. The concentration of allergens in the environment varies, depending on various factors including climate, vegetation, and air quality. Aeroallergens including pollens (plant pollens), fungi, domestic mites, domestic animals and insects are the most important factors initiating allergic diseases (7). Fungal spores are universal atmospheric components that are found indoors and outdoors and are associated with a number of allergic diseases in humans including allergic rhinitis, conjunctivitis, bronchial asthma and allergic bronchopulmonary mycosis resulting from exposure to spores (8, 9). At least 600 species of fungi are in contact with humans and less than 50 are frequently identified and described in epidemiologic studies of indoor environments (10-12). The prevalence of respiratory allergies to fungi has been estimated at 20% to 30% among atopic individuals and up to 6% in the general population (8). Previous studies from various areas of Iran have focused much more on the concentration and distribution of fungi in different patients with pulmonary and respiratory disorders; therefore the present study evaluated the presence and relative abundance of fungal flora in nasal cavity and bedroom of healthy individuals. Our study showed that dominant fungi recovered from nasal cavity and bedrooms of healthy volunteers were Aspergillus, Penicillium, Yeast, Alternaria and Cladosporium; these findings are in agreement with the findings of several other researches (3, 13-19). Generally, indoor fungi are a mixture of those that have entered from outdoors and those from indoor sources. Aspergillus spp. and Penicillium spp. are less common outdoors and are usually considered as major indoor fungi (20). Alternaria and Cladosporium are dark cell-walled moulds, growing as a saprophyte or pathogen organism on decaying wood, compost, plant, food, and different types of soil. These moulds are the most cosmopolitan fungi involved, particularly in temperate regions, due to their almost permanent presence in outdoor and indoor air (21). Cladosporium and Alternaria sensitivity has been reported at around 10% in the literature and 3% to 30% in European countries (22, 23). In our study, Aspergillus, Yeast and Cladosporium were the most abundant genera in bedroom air. Several studies have investigated the distribution and frequency of airborne fungi in indoor environments (10). Hedayati et al. in north of Iran reported that the predominant genus in bedroom of asthmatic patients’ houses was Cladosporium (15). de Ana et al. in Spain suggested that Cladosporium and Penicillium were the most isolated fungi in indoor environments of the homes of patients allergic to fungi (19). Yazicioglu et al. in Turkey noted that the most common indoor molds identified in the homes of asthmatic and control children were Cladosporium, Rhizopus, Penicillium, Alternaria and Aspergillus (5). Cetinkaya et al. also from Turkey showed that the most commonly isolated mold in the indoor air of the sampled houses was Cladosporium, followed by Aspergillus, Penicillium and Alternaria (3). Unlu et al. revealed that the most frequently isolated genera were Penicillium, followed by Cladosporium, Aspergillus and Alternaria in the indoor air of the houses of asthmatic patients in the southwest region of Turkey (13). Su et al. isolated Cladosporium, Aspergillus, Penicillium, Alternaria and Yeast as the most predominant indoor molds in the homes of asthmatic and non-asthmatic children in southern Taiwan (17). Awad et al. in Egypt reported that the most prevalent fungal organisms recovered in the air of urban and rural homes were Alternaria, Aspergillus, Cladosporium, Penicillium and Yeasts (24). Sharma et al. in India showed that in control homes (non-asthmatic/healthy volunteers), a similar spectrum of fungi was observed as in the homes of asthma patients, and different species of Aspergillus, Alternaria, Cladosporium, and Penicillium were the most prevalent fungi in homes of Delhi (16). In the present study, the most dominant fungus isolated from the nasal cavity was Aspergillus (64%), followed by Penicillium (12%), Yeast (8%) and Alternaria (6%). Kordbacheh et al. isolated A. flavus (7%), A. fumigatus (1%) and Rhizopus sp. (1%) from patients with nasal polyposis (25). The study conducted by Arabi-Mianroodi et al. showed that the fungi isolated from nasal mucosa of healthy adults were detected with the following frequencies: Yeast (12%), Aspergillus (8%), Penicillium (3%) and Mucor (1%) (26). Likewise, Darwazeh et al. reported that the predominant species isolated from healthy subjects of Saudi Arabia was Candida spp. (52%) followed by Aspergillus spp. (21%) (27). Sellart-Altisent et al. noted that the most abundant genus isolated from the nasal cavity of allergic and healthy subjects was Cladosporium, followed by Penicillium, Aspergillus and Alternaria (28). According to the World Health Organization (WHO), more than three billion people have diseases caused by indoor air pollution (29); in 1982, the concept of “Sick Building Syndrome” (SBS) was introduced, a term used to describe symptoms in humans, which result from problems with indoor air quality (30). The quality of air and the number of pathogens, including fungi in indoor environments depend on the condition and cleanliness of the building, appropriate humidity and temperature and good ventilation, access to light, oxygen and water (31). Warm and damp conditions, poorly maintained heating, ventilation, and air-conditioning (HVAC) systems, changing of key factors, including life-style habits and the construction of buildings with new materials as well as external factors such as increased pollution have been recognized as important causes of the growth and distribution of indoor fungi. Fungi are regarded as one of the causal factors of respiratory allergies and are a serious threat to public health in indoor environments. The presence of fungi in nasal cavity and indoors of healthy subjects in this study suggests that fungi should be considered as health hazards. Furthermore, it is important and seems necessary to monitor of indoor air quality and raise awareness of existing threats due to microorganisms, including fungi. The authors are grateful to the faculty of veterinary medicine, Ferdowsi University of Mashhad for funding this research (Grant no: 2/16045). Authors’ Contribution: Samaneh Eidi designed the study, supervised all the experimental design, analyzed and interpreted the results and drafted the manuscript. Abdolmajid Fata contributed to the study designed and supervised all the experimental design. Seyed Amir Kamali, Zahra Hajari, Reza Farid Hosseini, Mehdi Bakhshaee, and Ali Naseri: contributed to the sample collection. Funding/Support: Funding was provided by the Ferdowsi University of Mashhad (Grant no: 2/16045).